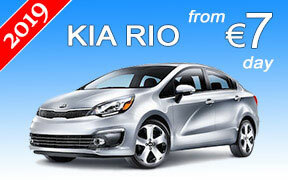 THE MOST TRANSPARENT and COST EFFECTIVE car rental booking engine to hire a car in BUCHAREST. Budget car rentals are offered in every rent a car class in BUCHAREST - economy car rental, sedan or estate car, family minivan, 12-17 passengers minibus, adventure 4WD, cargo van or a couch. Our BUCHAREST car rental fleet is built of reasonably priced cars for rent available at low rates starting from 7 EUR a day on all-inclusive basis - full insurance, unlimited mileage, second driver free on a single contract, pre-paid road taxes and everything else you may need with your car rental. Being long in the car hire customer service we know what you expect from us, and how to treat you. CAR RENTAL REVIEWS FOR BUCHAREST! We value our returning car rental customers and reward them with great online discounts. If you book over 3 car rentals with us, you are entitled to a discount rent a car coupon. Don't forget to check our BULGARIA CAR RENTAL TIPS and to ask for our latest AIRPORT TAXI HIRE deals in Bucharest. Romania′s capital Bucharest is located midway between the Carpathian Mountains and the Black Sea, in the southeastern part of the country and is a great city to explore. As Romania′s capital, Bucharest is the prosperous industrial, commercial and cultural center of the country and one of the main transportation hubs of Eastern Europe. However, it is not only the most economically-developed and industrialized city in Romania, but a diverse cultural center with interesting mixture of French palaces with baroque clam-shaped canopies, remains of medieval chapels, Byzantine-style churches, grey housing blocks, 21st-century office buildings, and long tree-lined boulevards. Bucharest′s astonishing range of architecture with the world’s second-biggest building and a number of superb museums, exquisite galleries, buzzing theaters, and fashionable parks has to be experienced. The bustling metropolis is a must-see, plus it is one of the starting points for trips inside Romania. The largest city in Romania has good transport connections with most European capitals and with the largest cities in Romania and one of the most extensive systems of public transport in Europe. However, there is no better way to enjoy your trip to Bucharest than touring it by a hire car. Motoroads.com makes Bucharest car hire very easy, accessible and affordable. One easy online car hire search on motoroads.com and you are guaranteed competitive Bucharest car hire rates, friendly and efficient customer service and a quality current model vehicle for your ideal holiday in this great city, for exploring the heart of Romania, or drive into the neighbouring Bulgaria. To reach Giurgiu from Bucharest by a car hire, take the E20 road southbound, to reach Constanta eastbound, take the A2 highway, to get to Brasov from Bucharest, take the E15 road northbound by a rental car. BUCHAREST CAR RENTAL » WHY MOTOROADS ? What you see is what you pay! We don't apply any hidden charges online or at our Bucharest car rental desk. Your Bucharest car rental booking is processed online instantly on a secure server. We require only a small amount to be paid in advance to secure the booking and the balance is due upon car collection in Bucharest. We apply the most fair fuel policy FULL-FULL for all Bucharest car rentals. You will get your rental car with full tank in Bucharest and have to return it full. Some exceptions may apply for busy rental periods. Our Bucharest car rental rates include full insurance - Third party liability coverage, CDW (Collision damage waiver), VTW (Vehicle Theft Waiver) and no excess. All Bucharest car rentals have unlimited mileage. The second driver on your Bucharest car rental contract is free of charge. We do not charge any additional fees for winterization (winter tires) online or at our Bucharest car rental desk. All cars are equipped with proper seasonal tires. You can change your booking free of charge up to 24 hours prior to car collection in Bucharest. It is subject to availability for the new car rental period.